Two train inspectors were caught life on camera dragging out a Nigerian man from a train in Germany after he reportedly refused to provide his ID and pay a fine for not having a ticket. Natalia Miletic who filmed the incident and posted it on Facebook, told the inspectors to stop what they were doing which wasn't right in the first place. “It’s absolutely not OK what you’re doing, the guy didn’t do anything to you. ”You should be ashamed of yourself, this is racism what you’re doing,”. “Why are you doing this? He paid.” The woman continues filming until someone seemingly tries to stop her. 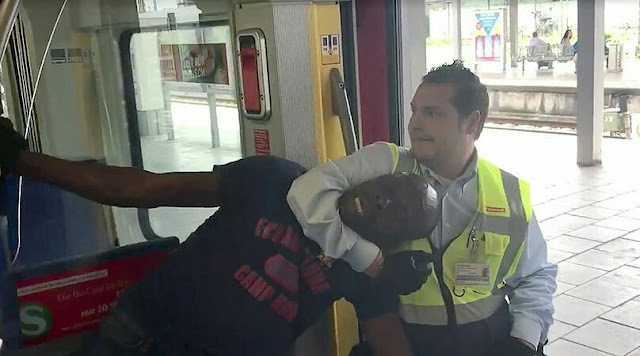 0 Comment to "Nigerian Man Forcefully Pulled Out Of A Train By Inspectors in Germany "